First, a very Happy Diwali to all you. I generally like to make things myself on special occasions and I hope you remember how I celebrated Diwali last year where I decorated my house mostly with home made things. They say necessity is the mother of invention and I can’t agree more. Here in my place, where I live in Andamans, more than half of the things are not available and the ones that are available are not worth the price. For eg. 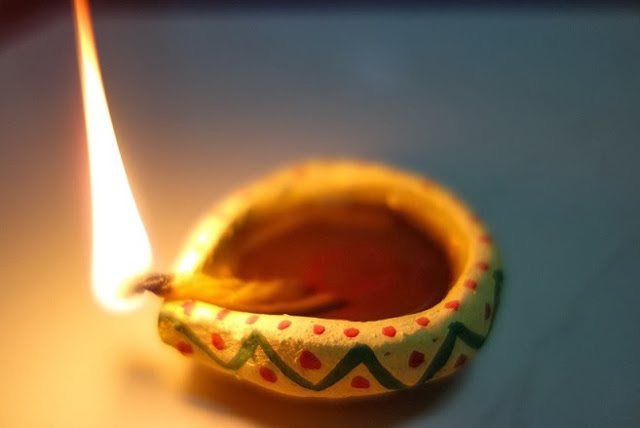 a simple, plain diya made up of clay costs about Rs. 20! This sends me in frenzy but also in super charged mode where I decide to make things on my own. I tried my hands at making candles at home and I have come up with 5 great DIY candles ideas that you can make at home. I live in Andamans and there is no dearth of beautiful, shiny sea shells here. I tried making these candles last year and this year too I have repeated them. These look absolutely adorable when kept on the centre table. How to make – Making these candles is very easy. Just melt some wax from used candles and pour it in the sea shells. Make sure the shells are kept straight. They tend to oscillate due to a pointed bottom. You can place them straight next to a wall or other hard surface. As the poured wax begins to solidy, place a small wick in the middle. Ready! I suddenly got the idea of making coconut shell candles. I have couple of coconut trees in my home and I decided to use the waste coconut shells. So, I scrapped one and made a sturdy candle from it. How to make – Just pour melted wax along with the wick. You may place a small twig or something on the coconut and hang the wick from the twig into the wax. As the wax solidifies, the wick becomes firm and the candle is done! Note: you can also simply fill it with oil and light it like a lamp. This one is my favorite. I made it today morning itself. Motivated after the white one, I decided to make one in a different color. How to make – Take a metal lid (plastic lid might melt with the hot wax), line it with aluminium foil. Pour melted wax on it. Add the wick a bit later. When the candle is ready on the lid, remove the foil along with the wax on it. Gently cut the wax in the shape of any flower you wish – lotus, rose or a simple daisy with a knife. Finally, cut the base of the wax off the foil. Your candle is now ready to illuminate your home! Simple, isn’t it? If you want to make a colored flower candle, you can grate some crayon and add it in the wax. This would add color to the wax. Add the color you want to appear in the candle. I have not made this yet but I am sure going to make it as soon as I spot an orange in the market. See, didnt I tell you we don’t get half of the things here? There is no orange available here and hence no orange candle yet! How to make – Cut an orange in two halves, separate the orange from the rind. 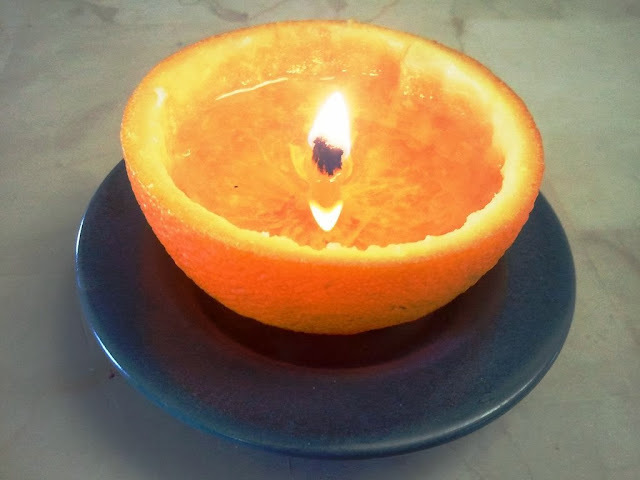 Pour melted wax in the orange rind and place a wick at the bottom. You can also use oil instead of wax. Edit: I did try my hands at an orange candle. This is how it turned out to be. I am in love with this orange, home made candle. Finally on the list are some home made diyas that I made last year. I have made some this year as well but I haven’t painted them yet. How to make – You can make them with clay and later roast them in high flame or you can make them with flour. I have made both kinds of diyas. The clay ones are simple to make as you just have to make a dough with clay, dry them in sun for a day or two and then roast them. The flour diyas are also made this way – make a dough (like you make one for chapatis) and knead it the shape of diyas. Dry it in sun or microwave it. I did both! Later, you can paint them in any color you want. I hope you like the ideas and I would share more ideas with you soon! Love ya all. Did you enjoy reading this post? If yes, then share it with your friends and let them enjoy too! 🙂 After all, sharing is good! wow! its gr8 didi, I mean how can a person have solution of every obstacle of happiness.. hats off 2 u..
hihihh.. nahi dear.. even I have my bouts of exasperation.. and more than that.. there is hardly any option other than being happy! Hi Surabhi…. I have tried flour diya for this Kartheeka Pournami… It came out well… Superb Idea of Microwaving 🙂 ……….. Anamika…. Nice and cute collection akka… I liked the flower and sea shell ones the most. Hey! Don't call me Surabhi ji Sandhya,, call me Surabhi. How have you been? How is college?